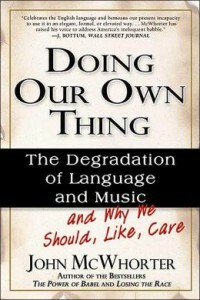 Doing Our Own Thing points out what the grammar-police often miss: there has always been a difference between conversational language and that used in formal oratory or written prose. Just about every culture has a colloquial, spoken form, and a ‘dressed-up’, eloquent form, seen in its diction, precision, and overall style. Everyday conversation includes a lot of hedging (“like”, “sort of” “kind of like” “y’know”), repetition, and colloquialisms. McWhorter has no complaint about this, and documents historical examples of how the language on the street and the language on the page or behind the lectern are, and have always been, very different animals. Having made this point, McWhorter’s book gets interesting. One cannot blame populism or the triumph of mass culture. These were present in the 50s, when the general public still expected speeches, letters and journalistic prose to contain English used with beauty, finery, and elegance. McWhorter homes in on the oratory of UC Berkeley activist Mario Savio in the 1960s, whose semi-refined, colloquial hybrid speeches set matters in motion for the counter-culture rejection of stylized form in oratory and writing. McWhorter’s thesis may be correct. Since then, the culture in general tends to be suspicious of form, suspecting some kind of chicanery, manipulation or power-play by The Establishment Elites when any artifice is detected. Only what seems to ooze out of us spontaneously is real, and anyone writing or speaking in a formal tone must be a snob, trying to strut his intellectual prowess before us all. This has profound implications for preachers. Is preaching the same as teaching? It seems to me that the teaching and admonishing of one another commanded in Colossians 3:16 can take place in all kinds of situations, which would surely use the everyday, conversational style of speaking. However, is the act of preaching the same or different from these contexts? Paul’s sermon in Athens (at least what Luke redacted into written form) appears to follow a rhetorical form that is elegant, artfully constructed and formalised. It certainly doesn’t seem like the language he would use while reasoning with people in the marketplace. Peter’s sermons seem likewise elevated in form and tone. To answer that question, we will have to answer several others. Does Paul’s ‘plainness’ (or ‘boldness’) of speech (2 Cor 3:12) correspond to colloquialisms and conversational language? Does God’s providential use of koine Greek for the New Testament suggest that the high tones of oratory have little place in the church? Is formalized oratory the mere ‘wisdom of men’ (1 Cor 2:4-5)? Even if not, does its perceived pretentiousness call us to embrace a more conversational tone for the sake of ‘contextualisation’? Does the nature of the message, and the nature of the occasion of preaching call for a specific tone not found in other settings? Can the conversational tone fail to command responses that a more elegant tone can? Does our current cultural situation call for artful rhetoric all the more, or do the demands of reaching the lost call us to adapt our approach to what men are familiar with? How shall we limit our own freedoms, rights, and preferences to reach men (1 Cor 9:19-22), without peddling the Gospel (2 Cor 2:17)? This entry was posted on May 31, 2013 at 2:33 pm and is filed under Uncategorized. You can follow any responses to this entry through the RSS 2.0 feed. You can leave a response, or trackback from your own site. Authoritativeness has little to do with style of language. Atheists make authoritative pronouncements all the time, and in colorful profanity strewn spew. The authority of any statement ultimately has to do with how much government force you can put behind it, or how much it fits with common sense. When your doctrine doesn’t fit with common sense, you use the club or the sword to enforce authority. Putting it in thees and thous won’t do anything. One reason, why, BT dubs, the Bible sounds so different from our common speech is because of how the ancient languages lacked development. Neither Hebrew nor Greek are as refined as English. They’re more like Spanish, a barbarous language. They leave out lots of words. In English it takes more words to say things, and its good, because we get the point across more clearly. Is Paul commanding Timothy to never drink water ever again? No. There is an implied “only” that the NT writers don’t tend to write, because compared to modern English their language is functionally illiterate. Now if you weren’t aware of this fact, you might think that in John 1:13 when it says “not by the will or man nor by the will of the flesh, but by the will of God” it literally mean the will of man is not involved at all! You’ve seized upon one part of the sentence – ‘authoritative’ – without considering the qualifiers – ‘language employed to delight, convict, and disturb in ways not possible for conversational speaking’. If you speak in conversational language with the style and language of a trained orator, then you probably don’t have many friends, or the ones you have put up with your goofiness. Chances are, like most today, you speak in a conversational tone during preaching. Every language has the capability of making this distinction. Your statements about Hebrew and Greek are plain wrong. Anyone who has knowledge of the originals can tell you that the kind of Greek used by Luke differs from the Greek used by John or by Mark. The style of Isaiah is very different from that of Amos. It all depended on the author’s abilities and purpose. My point is not about thees and thous. It is about the ability of language to stand erect, to speak reverentially, with dignity and poise. If that sounds elitist and snobbish, then you may have been drinking from the font of post-60s culture longer than you realise. Your point is interesting for its wrongess because of the fact that the New Testament is written in the average Greek of the street, which is why it is so barbarous. They could have written it in Attic if they were following your philosophy. But obviously they weren’t.